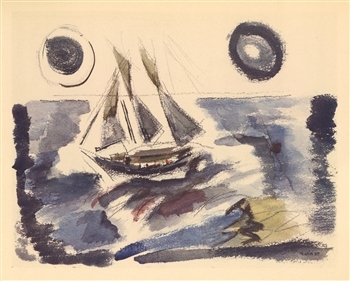 John Marin lithograph "The Three Master"
Medium: lithograph (after the watercolor). Issued in 1950 in a limited edition of 125. The image size is 8 1/2 x 10 3/4 inches; the full sheet measures 10 x 12 1/2 inches. Signed by John Marin in the plate, not by hand.